Interior Design as a separate career or pursuit, one that could actually be profitable, is an early 20th century phenomenon. Previously, even nobles and the aristocracy used furniture workrooms and drapers to decorate their homes – essentially tradesman with perhaps a local reputation. The concept of the interior designer as a paid professional and later a celebrity status arose after the work of four brilliant early pioneers set the stage – literally, the room as a stage – for all the talent that would come as the 20th century progressed. The early “designers”, all women – Elsie de Wolfe, Syrie Maugham, Sybil Colefax and Dorothy Draper brought their unique perspective and their personal style to a world chocking on the bric-a-brac of Victorian style. Their individual aesthetics would change the very nature of decorating homes. In the 1950’s, Mario Buatta and Sister Parrish established their uniquely American styles. Buatta proved that interior designers could attract licenses for everything from furniture and fabrics, to lamps and linens. The interior designers of today are lauded in magazines and books devoted solely to the world of interior design. Celebrity interior designers now have their own TV shows, product lines and books. Since to-the-trade design centers across the U.S. are closed to consumers, a designer by your side opens an entire universe of choices. Although the best-known maintain offices in Los Angeles and New York, there are interior designers in every city in the U.S., and local ASID chapters can assist in pointing out regional designers near you. 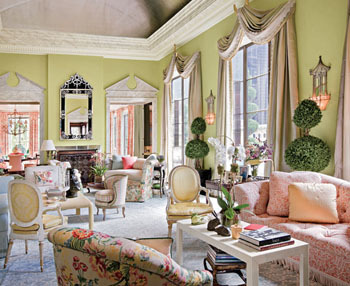 Many of today’s most celebrated interior designers are as unschooled as the earliest Grand Dames of design, but they have that ineffable quality – taste. Their work sets the tone for an elegantly-lived lifestyle– whether ultra-modern, Hollywood-glam or French Country, interior designers create the cocoons of our desires.